This has been an exciting week for Halle Saint Pierre. On Monday, all those who contributed artwork to the new exhibit—curators, gallery owners, collectors, and artists—gathered for a reception celebrating Raw Vision: 25 Years of Outsider Art. 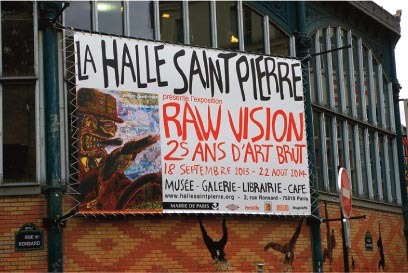 Halle Saint Pierre welcomed the press to view the exhibit on Tuesday afternoon, and that evening Raw Vision opened to the public. Many curators were at these celebrations, including Caroline Bourbonnais, curator of La Fabuloserie; Frans Smolders, curator of Collection de Stadshof; Alexander Couckhuyt, curator of Museum Dr. Guislain; and Dr. Johann Feilacher, curator of Museum Gugging. The directors of the galleries Henry Boxer, Andrew Edlin, Christian Berst, Galerie Toxic and Les Yeux Fertiles came to the opening, as did Roger Cardinal, who famously coined the term ‘Outsider Art.’ Also present were featured artists C. J. Pyle, Ody Saban, Norbert Kox, François Monchatre, and Ben Wilson, who created a painting of Halle Saint Pierre on a piece chewing gum on the sidewalk outside. Artist Tom Duncan flew in from New York to set up a huge interactive sculpture dedicated to Coney Island. On Tuesday a crowd gathered round with journalists pushing the buttons to make the rides move. Artist William Thomas Thompson, who began creating art after receiving a vision from God about the second coming of Christ, came with his grandson to view the exhibit. Three of his extremely large-scale paintings of the Book of Revelations flanked the lobby of Halle Saint Pierre. Full of emotion, William said that this—being included in this show in Paris—was the most significant achievement of his life. On Tuesday night John Maizels, founder and editor of Raw Vision and co-curator of the exhibit, paid homage to Sam Farber, to whom the show is dedicated. Farber was an early advocate of Outsider Art, and provided critical financial support to ensure that Raw Vision persisted through difficult times. Martine Lusardy, director of Halle Saint Pierre, spoke about the long established relationship between Halle Saint Pierre and Raw Vision. The two share a vision of bringing international Outsider Art to the public. This show is an extension of that vision, and a source of honor to all who have been involved. 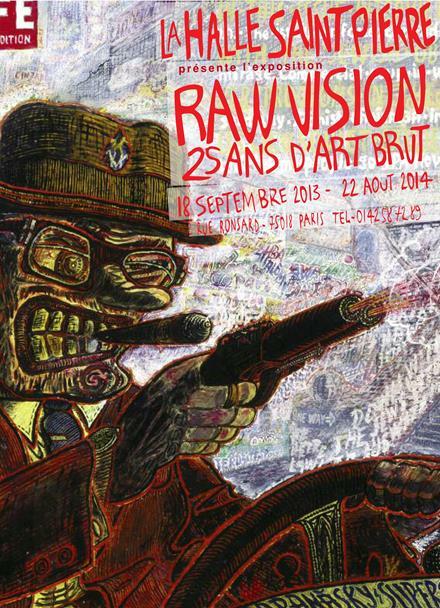 The exhibition runs until 22 August, 2014.